Properties in Antoingt average 4.7 out of 5 stars. 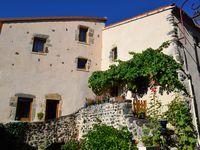 Gite Old barn completely restored, lots of charm! Property 10: Gite Old barn completely restored, lots of charm! apartment in residence: tourist site. Property 18: apartment in residence: tourist site. Quiet location with great views. Games room. Patio, large garden. Property 19: Quiet location with great views. Games room. Patio, large garden. Usson, tranquil and quiet town, rent comfortable house, beautiful views. Property 25: Usson, tranquil and quiet town, rent comfortable house, beautiful views. Property 48: Apartment "Le Clos"
Very nice property well located in quiet village. Short walk to restaurants and short drive to surrounding towns. Sit on the terrace and observe a bit of the daily life of locals as they pass by. We really enjoyed our stay here and would definitely come back if we were in the Auvergne.